Back-to-school time is fun and exciting, yet it can be challenging and overwhelming too -- sometimes all at once! This is especially so after you and your family have enjoyed a long, relaxing summer filled with lots of great adventures together. 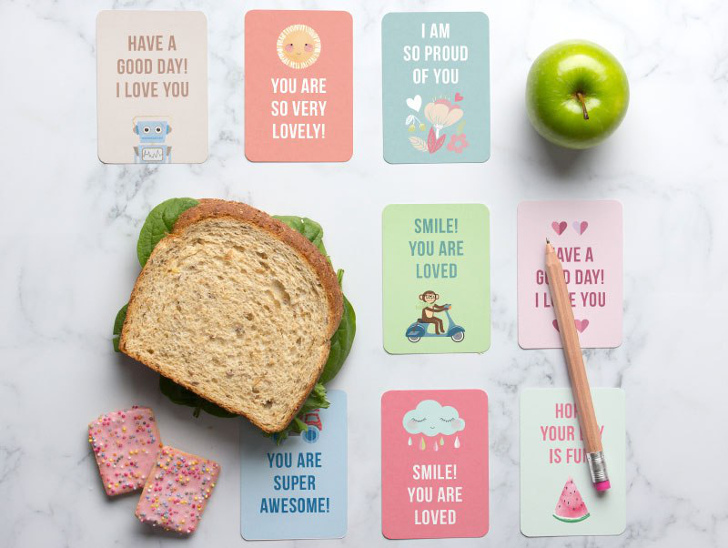 To help keep that connection going into the school year, we've rounded up 12 adorable and encouraging sets of lunchbox notes that you can slip into your child's lunches to let them know you are thinking of them, even though you may be apart. Better still, all of these designs can be downloaded from their designer's website for free. Robots, dinosaurs, watermelon and monkeys riding scooters, what’s not to love about this pastel-hued set of printables from Tiny Me? 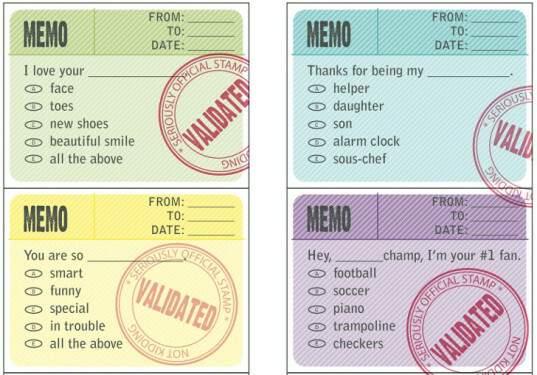 The printables are also double sided, so you can add your own personal note on the reverse. The fresh colors, Kawaii illustrations and the cute touch of the lined paper make this batch of notes really stand out. They’re designed by Kristen Magee (Paper Crave) for the blog Living Locurto. 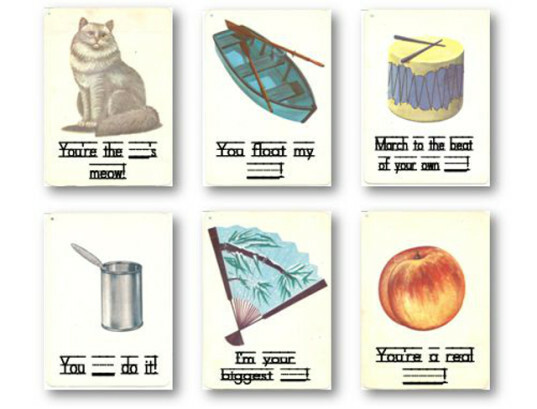 Is it the retro illustrations, the learn-to-write homage to school, or the corny Dad-joke-level puns that make these lunchbox notes so appealing? Whatever it may be, Rook No. 17 has 18 designs to choose from, all based on an old set of alphabet cards she found. You can also download a free storage box printable from the site to store the notes in if you print them on a sturdy cardstock. Did you get the memo? The one about you being the best kid in the world? 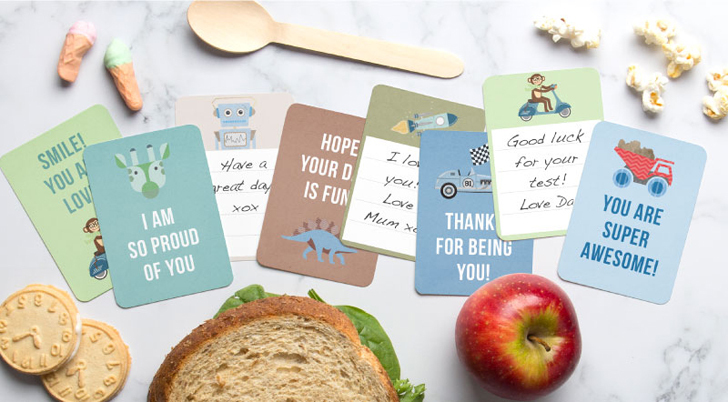 The formality and “grown-upness” of these memo-style lunchbox notes from Today’s Mama is a big part of their appeal, and you’ll be able to have fun checking off some of the cheekier options on these lists from time to time. 5. Donut buddies from Oh, Happy Day! 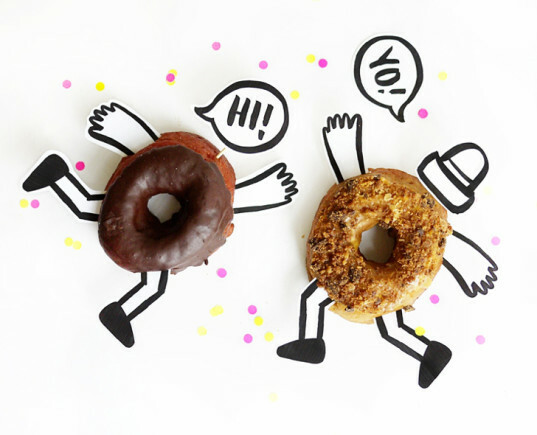 These whimsical donut buddies from uber party planning blog Oh, Happy Day are pretty cute, but you don’t have to limit yourself to just pairing these printables with donuts. They would work just as well with a sandwich or a piece of fruit and — hey, presto! — you’ve got a healthy buddy. Customize the backs of the speech bubbles for extra words of encouragement. Even a droid needs a word of encouragement now and then! These robot lunchbox printables from Tangarang are sure to appeal to sci-fi fans, and designer Kira Franz-Knight also has some other cute lunchbox notes featuring woodland critters available on her website. These charming hand-drawn illustrations from Fresh Picked Whimsy are packed full of word play and puns: sure to raise a smile from any child, even if a math test threatens after lunch. 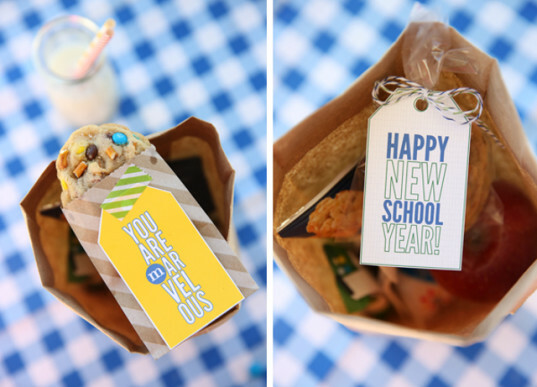 The tag style of these printables from Our Best Bites make them very versatile: tie them around a cookie bag, tape them to a brown paper bag, or simply slip them in with the sandwich. 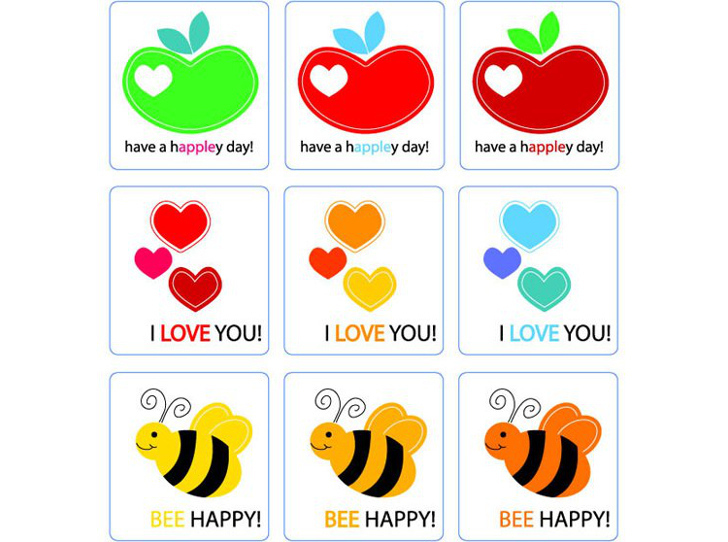 However you use them, the bright colors and bold fonts are sure to get your message of love and encouragement across. Tell it like it is! Skip to my Lou‘s speech bubble lunchbox notes have a retro style, bold colors and plenty of puns. Tick, tick, tick! STML have several other lunchbox note designs to choose from too. These bold, bright images of apples, bees and hearts are sure to appeal to little ones in particular. Marla Meredith has these cute little designs available in three different colorways too. 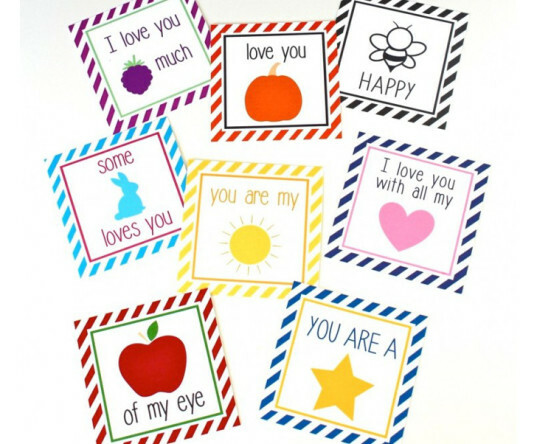 These fun, stripey lunchbox notes from I Heart Naptime get the message across in no uncertain terms. You do need to invest a couple of dollars in a 2″ circular hole punch to get the full effect of these clever little fruit-themed notes by Cindy Hopper for Alpha Mom, but you’ve gotta agree, the results are worth it. Mix and match the notes with contrasting rubber bands, or print onto stickers to slap straight on the fruit. Lead image by Tiny Me. Photos by 1. Tiny Me, 2. Kristen Magee for Living Locurto, 3. Rook No. 17, 4. Today’s Mama, 5. Oh, Happy Day!, 6. Tangarang, 7. Fresh Picked Whimsy, 8. Our Best Bites, 9. Skip to my Lou, 10. Marla Meredith, 11. I Heart Naptime, 12. Alpha Mom. Robots, dinosaurs, watermelon and monkeys riding scooters, what's not to love about this pastel-hued set of printables from Tiny Me? The printables are also double sided, so you can add your own personal note on the reverse. The fresh colors, Kawaii illustrations and the cute touch of the lined paper make this batch of notes really stand out. They're designed by Kristen Magee (Paper Crave) for the blog Living Locurto. Did you get the memo? The one about you being the best kid in the world? The formality and "grown-upness" of these memo-style lunchbox notes from Today's Mama is a big part of their appeal, and you'll be able to have fun checking off some of the cheekier options on these lists from time to time. These whimsical donut buddies from uber party planning blog Oh, Happy Day are pretty cute, but you don't have to limit yourself to just pairing these printables with donuts. They would work just as well with a sandwich or a piece of fruit and -- hey, presto! -- you've got a healthy buddy. 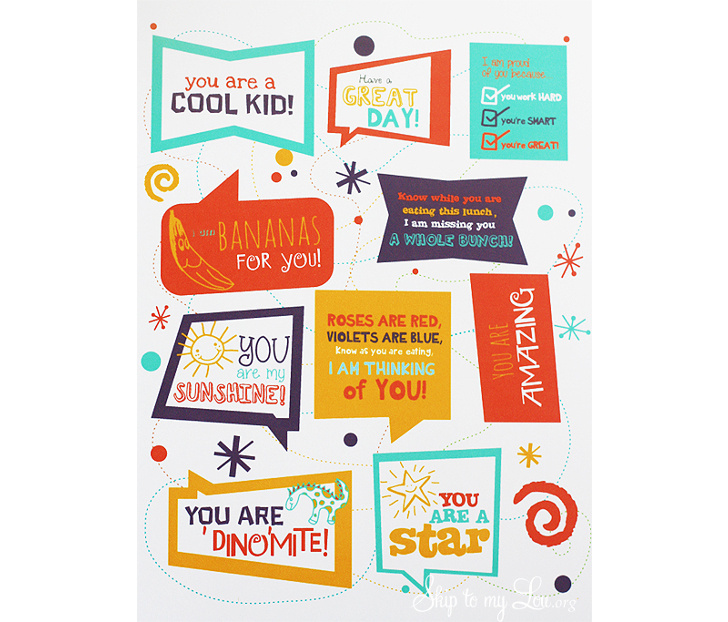 Customize the backs of the speech bubbles for extra words of encouragement. Even a droid needs a word of encouragement now and then! These robot lunchbox printables from Tangarang are sure to appeal to sci-fi fans, and designer Kira Franz-Knight also has some other lunchbox notes featuring woodland critters available on her website. Tell it like it is! Skip to my Lou's speech bubble lunchbox notes have a retro style, bold colors and plenty of puns. Tick, tick, tick! STML have several other lunchbox note designs to choose from too. 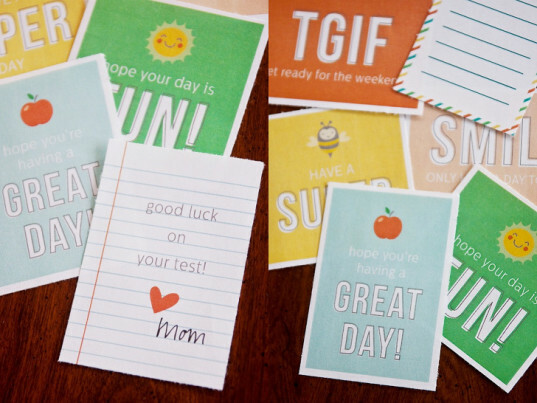 You do need to invest a couple of dollars in a 2" circular hole punch to get the full effect of these clever little fruit-themed notes by Cindy Hopper for Alpha Mom, but you've gotta agree, the results are worth it. 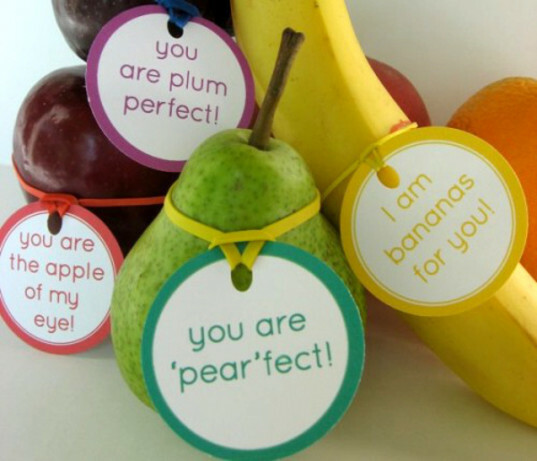 Mix and match the notes with contrasting rubber bands, or print onto stickers to slap straight on the fruit.